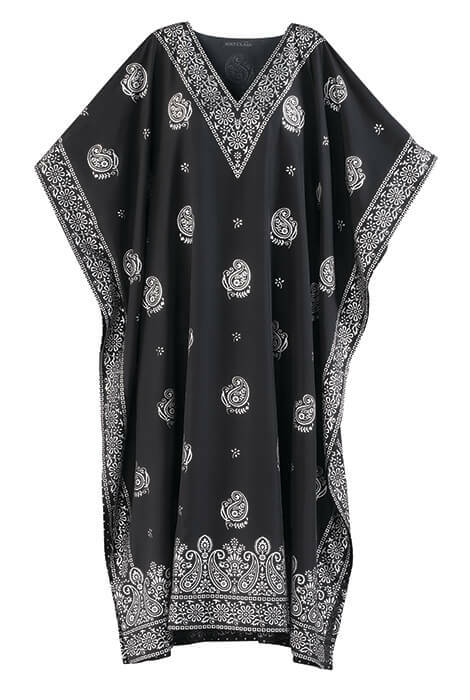 When you want to lounge comfortably and still look great, slip into this pretty Black Paisley Caftan. A loose, easy-wearing caftan robe for relaxing at home or slipping over a swimsuit at the beach, its silky-soft fabric feels light and drapes beautifully. Featuring a white paisley pattern on black with white floral-print border at V-neck and along sides, this caftan dress is right on trend with a bit of boho style. Designed exclusively by Sawyer Creek Studio™, the flowy, slip-on caftan features a V-neck and short flutter sleeves. One size fits most. 100% polyester; machine wash. Imported.